The US invasion of Haiti in July 1915 marked the start of a military occupation that would last 19 years - and that fed an American fascination with Haiti that would flourish even longer. 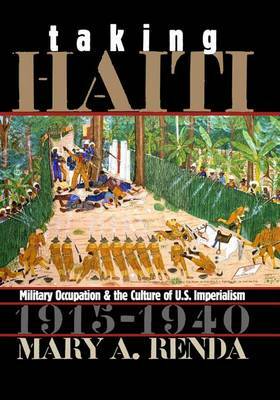 Exploring the cultural dimensions of the US contact with Haiti during the occupation and its aftermath, the author shows that what Americans thought and wrote about Haiti during those years contributed in crucial and unexpected ways to an emerging culture of US imperialism. At the start of this emerging culture, Renda argues, was American paternalism, which saw Haitians as wards of the United States. She explores the ways in which diverse Americans - including activists, intellectuals, artists, missionaries, marines and politicians - responded to paternalist constructs, shaping new versions of American culture along the way. Her analysis draws on a rich record of US discourses on Haiti, including the writings of: policy-makers; the diaries, letters, songs and memoirs of marines stationed in Haiti; and works by such writers as Eugene O'Neill, James Weldon Johnson, Langson Huges and Zora Neale Hurston.